After 4 days of constant partying, it’s safe to say every player and staff member are hungover and tired from playing and dancing — which means CeleBreak Barcelona did a great job! 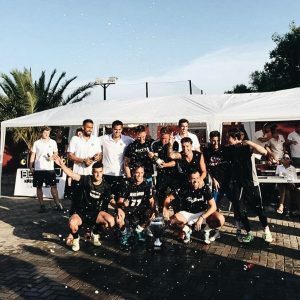 A huge congratulations to Sutton FC for winning 1st place for the second edition of CeleBreak – you played the hardest, you gave it your all, and you threw an amazing welcome party! 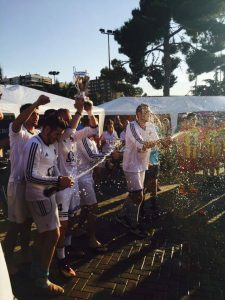 Thanks to a few cans of cold beer and the beautiful Spanish sunshine, all of the players were motivated to have a great time on and off the fields. We had some crazy teams this year, especially FC Laissaud, a french team who partied nonstop for 3 days! Congratulations on winning the hashtag competition and the Neymar jersey – you guys were the best! Also a big congratulations to a few of the players who won awards such as the best goalkeeper which went to Daniel Pastuszka, and man of the tournament which went to Kevin Gonnaud. A big round of applause to CeleBreak for taking 2nd place and Les Plots for taking 3rd place! Shoutout to all of the staff at CeleBreak for organizing an amazing event, with something to keep everyone happy – from cold beer to FIFA, from DJ music to foosball, from sizzling sausages to the Euro Cup matches – you guaranteed that everybody had a great time! This year was even more incredible than last year, and it just keeps getting better!